Categorized as: Stories on January 11, 2014. Family breadwinners: Mother and daughter-in-law live and work side-by-side high in the Andes Mountains on the shore of Lake Titicaca. 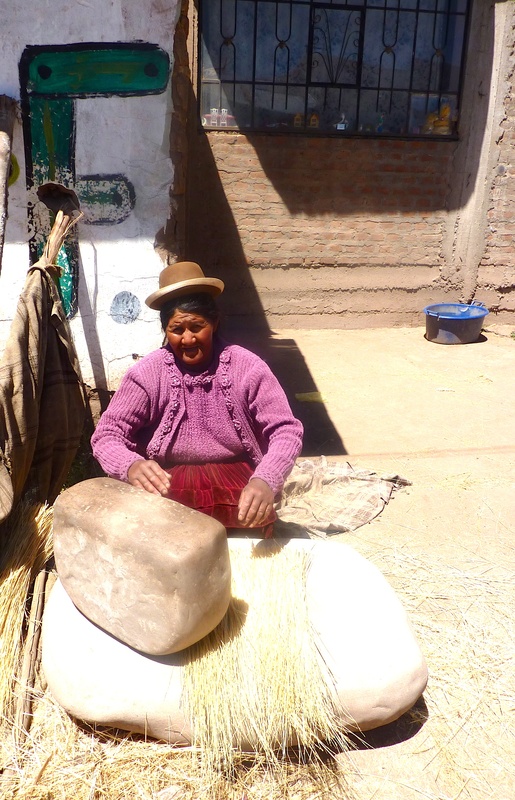 Using ancient pounding and looming techniques, they run a busy microenterprise and have earned enough to invest in their homes, computers, and education. Part 1 of our 5-part series from Peru. The women featured are clients of our longest-term partner, Freedom from Hunger, a nonprofit that specializes in bringing a trio of financial services (credit, savings, and insurance), informal education, and healthcare services to 5.7 million of the world’s poorest women in rural and periurban environments. 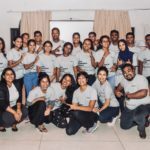 Traveling with Freedom from Hunger, I’ve met hundreds of their hardworking clients in several countries, yet I still can get surprised by the creativity employed in not just eking out a living, but shaping a self-determined life. 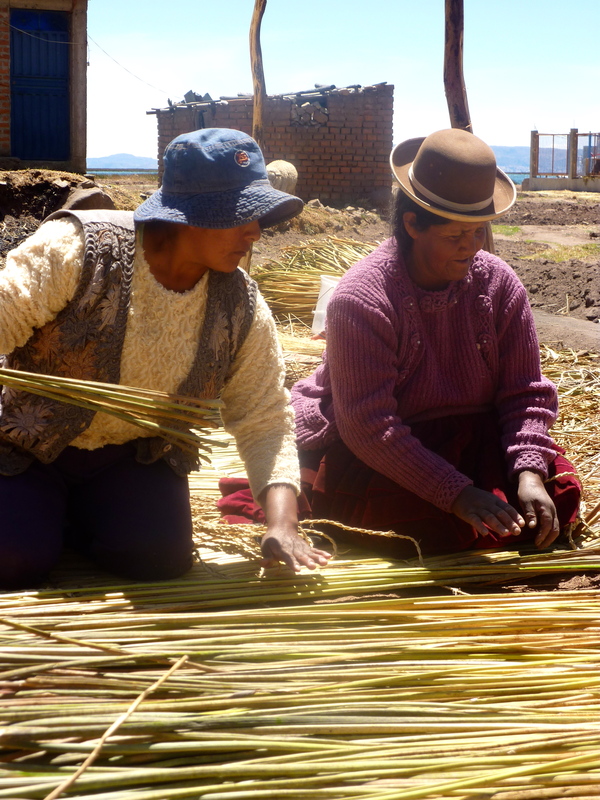 Angelica (L) and Feliciana (R) work quickly, alternating roles between shuttling reeds and tying off ends. They intend to complete this 30′ roof-insulation mat before nightfall. Behind them, the peek of blue is the water of Peru’s Lake Titicaca. 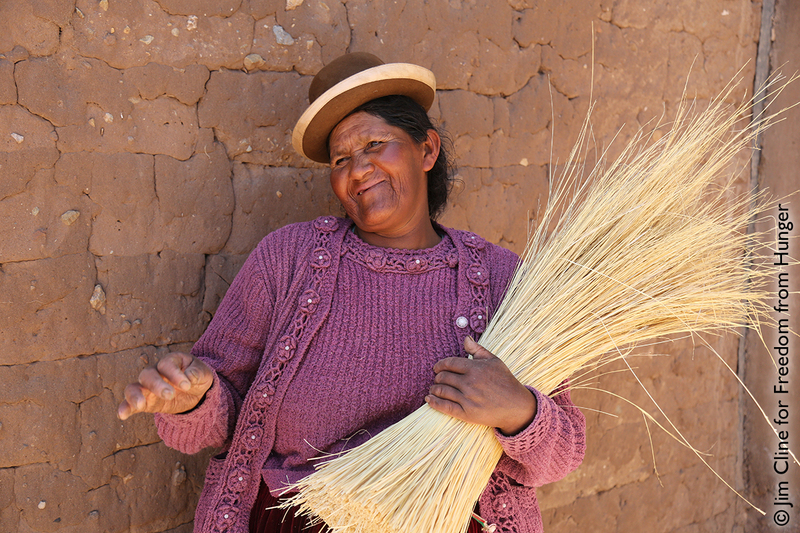 Juliaca, Peru: Living next-door to and working long days alongside your mother-in-law might not appeal to everyone, but in a tiny town on the shore of Lake Titicaca just south of Puno, Peru, this duo relies on each other for everything. Feliciana Canqui de Cuno, age 54, and Angelica Panca Conahuiri, age 30, work long days in the blistering Amazon sunlight, in an open field on the banks of the lake. They are totoro reed weavers, who transform the reeds that grow in this lake into strong twine, bed mattresses, and home-insulation mats. Living in adjacent casitas or cottages across the street, the two women say the key to their partnership is independence. “We have no problems working together, Actually, we work independently,” Feliciana explains in Amyra, her local dialect, “and sell our materials separately. We practice ayni, a local tradition of switching off and taking turns.” That means one day, daughter will help mama with one of her orders; and the next day, they’ll switch. Today happens to be daughter Angelica’s turn: They’re working quickly to complete a big order for a 30’-long roof insulation mat. It’s key to insulate here—inside both the roofs against the boiling afternoon sun, and the walls, against the frost that descends each evening. Living at such a high elevation (12,549 feet) near Juliaca in the Andes Mountains, in a climate at once subtropical and highland, they work outside from freezing dark predawn, through the harsh heat of the day. Feliciana’s “desk:” She manipulates the top stone to mash reeds into fibers which she then deftly twists into rope that will tie their insulation mats and bed mattresses together. She is sitting on a third stone. These pieces are part of the capital equipment that she and her daughter-n-law bought with their credit loan. The pair joined their local credit group four years ago. They have fourteen members and call themselves “Little Reeds,” a pun on their livelihoods. 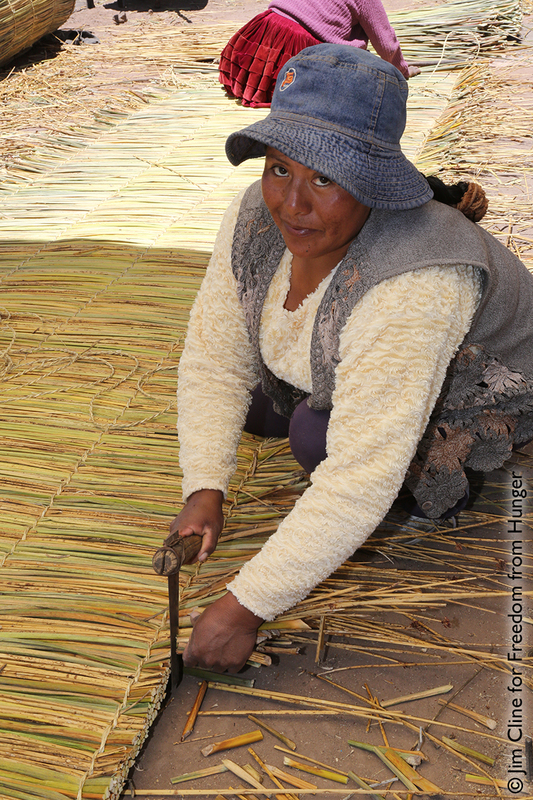 They’ve used their loans to purchase an enormous stone—otherwise known as Feliciana’s “desk,” where she smashes reeds into straw which she then twists into rope—and a casana, a sort of loom that lays on the ground as a frame for their mattresses and insulation mats. Feliciana lives with her husband, Juan Maximo. They have three children: Enrique (37), married to Angelica and working in Cusco during the week as a professor; a daughter (30) who lives away, and a son (15) who still lives with them and attends school. Next door to Feliciana and Juan Maximo, Enrique and Angelica live with their only son (11). “Little by little we invest in our business, and little by little we build our houses and our lives,” Angelica smiles. This year, she built a second story onto her house. 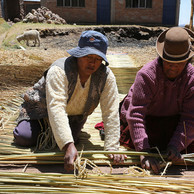 Feliciana (L) with her bundle of reeds and Angelica (L) means business trimming the edges of a roof-insulation mate. 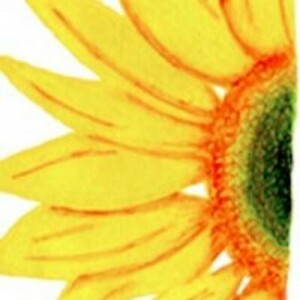 Their credit group provides classes in business management, gender relations, and women’s empowerment. They encourage savings—something Angelica and Feliciana both proudly practice. “I recently took out $534 to buy my husband a laptop, because he travels so much with his work,” says Angelica. “And I took money out of my savings account and bought a laptop for my youngest son, as well,” Feliciana chimes in. “I still have over $400 in my savings account, that I plan to use to build a second story onto our home as well.” The two women have life insurance policies that cost just 36 cents, that will pay their families $1,000 upon natural death and $2,000 for accidental death. LEARN more about Freedom from Hunger’s approach to ending poverty and injustice in Peru through access to education, healthcare, and enterprise here. SHARE this story with your friends and family with your networks; see menu above. 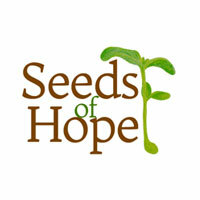 DONATE to end poverty through self-help here.